Happy New Year, everyone! This Christmas, my family gave me an iPad. I did not expect it at all, and it was a wonderful surprise. I realize that I’ve said a few things here and there that suggested I would enjoy having one, but I didn’t expect that I would get the opportunity until it became a necessity for development purposes for my job (which will happen sometime in 2011). Getting familiar with the tablet has been a fun and interesting experience. I have always used PCs from my earliest days—starting when I was seven with a 286 that my dad owned, learning the ins and outs of DOS, and expanding my skillset as technology improved. I started learning my first programming language using QBASIC and a great instructional book when I was eight (Goki Blaster, anyone? ), and I built my first desktop PC when I was ten. It was a Pentium 75 MHz, and boy was I happy with it. Its *cough* blindingly fast processor helped me when I moved from interpreted to compiled languages, and I spent the next couple of years learning C, still in a DOS environment. I did learn some CA Realizer and later some Visual Basic in a Windows environment, even attempting to tackle Microsoft Foundation Classes in Visual C++ 4.0. That didn’t last very long. In the late 90s, I built a Linux server and played around with Red Hat 5, Mandrake, and Gentoo, and experimented with the console (obviously), plain old X, KDE, and Gnome. Most of my daily computer usage stayed in a Windows environment though. I bought a Mac mini—the only Apple hardware I owned prior to the iPad—around 2007 in order to have something to perform more complete cross-browser testing on, since by that point I was firmly established in my web application development job. However, before I got to make any real use of that machine, Safari became available on Windows, and browsers continued to move towards a unified rendering behavior. I probably only ever even powered on the Mac mini three times: once when I got it, once for fun, and once to reset the user information before I sold it. My first smartphone was an HTC Wizard (the Cingular 8125), a Windows Mobile 5 phone with a hardware keyboard and resistive touch screen. I was happy with that for quite a while, and it served my needs well. I upgraded later to an HTC Kaiser (the AT&T Tilt), still Windows Mobile with a hardware keyboard, but newer and faster hardware and software. That also served me well. The iPhone became available while I owned the Kaiser, but I didn’t own any other Apple hardware, and I appreciated the very clean sync with the Windows/Outlook/Exchange system I was using at the time. I was also long past my 2-year cell phone service agreement (I still am), and very much appreciated not being locked into a contract, and I had (still have!) a grandfathered data plan. So, I didn’t want to buy a subsidized iPhone, extend my contract for two years, and double my data costs. At the same time, I didn’t want to pay full price for an iPhone either, when I wasn’t particularly drawn to the phone over what I had. My brother bought an HTC Dream (the T-mobile G1), the very first Android phone that came out, and I got a few chances to play with that while I still had my Kaiser. Being a programmer familiar with Java and partial to open source, I was drawn to that phone over the iPhone because of its broad customizability and the potential for the Android OS in general. The UI was also much, much nicer than Windows Mobile 6. I decided I would probably buy an Android-based device next, rather than an iOS-based one, mainly for the development environment. This pseudo-decision was encouraged by the fact that I had recently moved my entire email system (with half a dozen accounts) to Gmail, and I was in the process of moving my calendar system from Outlook/Exchange to Google Calendar. And that’s exactly what I did—I bought a G1 of my own, used it for a few months, then upgraded to a Motorola Milestone from Telus (the GSM version of the ever-popular Droid on Verizon), compatible with AT&T’s 3G frequencies. That is the phone I have now. Now, honestly, I don’t remember ever being antagonistic towards Apple, either the company or the hardware or software. I used to think it was really weird when I was younger, mainly because it was unfamiliar to me. I started paying more attention when OS X came out, since it was built on Unix and that meant I had at least a little applicable knowledge. I was perfectly happy with Windows and Linux for everything I needed to do though, and so I never had a reason to pay a premium for hardware and software that was both unfamiliar and unnecessary for my needs. With the rise of tablet computing, and particularly with the iPad as the first real contender, I began to wonder how I might use such a device myself. I am not an artist in the classic sense, and virtually all of my computer usage is done from using the keyboard. I don’t play many games, and the ones I do play are not usually immersive 3D first-person type games, so I don’t use the mouse much beyond web browsing and basic operating system UI control. I work from home, so most of my computer usage is done in my home office on my desktop, or occasionally on my laptop on the couch in the living room. That pretty much describes all my computing habits. I’m not saying they are optimal for everyone, but they fit my needs. I work from home, so using my desktop for music makes sense. If I were still going to college or driving a lot, I might switch to my phone or buy an iPod or something. I used to do all of my programming on my laptop because I’d take it to and from the company office, but since I started telecommuting full-time, it made more sense to switch to a desktop. Plus, having three big TFT displays is invaluable for simultaneous development, testing, and research. Just a few clarifications here: “games” in a desktop context are things like Portal, Cogs, Puzzle Dimension, Chaos Theory, and Obulis (I do like puzzle games). “Games” in a smartphone context are things like Sudoku, Yahtzee, Papijump, and Angry Birds. Also, when I say “time management,” I mean things that help me manage what I have to do and when I have to do it: Google Calendar and Tasks, for example, or Outlook. Lately, I’ve been using Remember the Milk for personal tasks, and GoPlan for work tasks. So, what should I do with a brand-new and wholly unexpected iPad? That’s what I’ve been discovering in the last week. Which of those tasks shown above will naturally migrate to the iPad? Which should I try to move there, even if they don’t naturally shift? What new activities will I begin doing because I have a new kind of device? The primary detractors of tablets in general, and the iPad in particular, seem to make the argument that it’s just an extra device crowding a functionally saturated space—that if you have a smartphone, a netbook, a laptop, and a desktop, it’s hard to justify a tablet except for very specific market sectors, like the medical industry. In one sense, saying that I need a tablet is not true at all. I’ve done just fine without one, and even having used it for the last week, I could certainly survive without it, especially for my most important tasks. Then again, I haven’t had a chance to fully integrate it into my routine or explore everything I can do with it yet, so I might just be ignorant of some things that I will soon learn and classify as a need. One thing that I believe will eventually fall into this category, even though it isn’t legitimately there yet, is iOS development. I can’t do it without Apple hardware, at least not simply or legally. I don’t need to do it yet, but I will one of these days. So what do I as a long-time Windows/Linux/Android user think so far, having played with an iPad for a week? After the initial shock of realizing the white box with the Apple logo on it was appropriately sized to hold an iPad, I began the discovery process. They gave me the 16GB wifi version of the device, which is more than fine with me. I’d only need more storage capacity for storing music and/or movies on it (which doesn’t fit my usage pattern), and I don’t need 3G because my phone can easily act as a wifi hotspot anywhere other wifi is unavailable. It’s slightly heavier than I imagined. However, it’s not so heavy as to be inconvenient. I can hold it with one hand and use it with the other hand without my arm getting too tired. I have mostly been using it for the last week either on the desk or in my lap, but I have used it some while standing, and it’s not bad. I think my initial surprise at the weight was only due to the fact that I’m used to my phone, which is obviously much lighter since it’s so much smaller. The display is beautiful, and the touch sensitivity is spectacular. Apple seems to be able to consistently beat the competition in this regard, at least in terms of sensitivity. I’d only used resistive touch screens (bleh!) before the G1, and the shift from those to capacitive screens was like night and day. The comparison between what I’m used to on my Milestone and the iPad is much less noticeable, but it’s still enough to recognize. Props to Apple for this one. Also, the mere size of the display (10″ instead of 3.7″) makes the iPad easier and more versatile than a smartphone when it comes to visual presentation. The Milestone has a great high-res display as well, but some things are just harder to do with a small screen. The iPad’s 10″ display running at 1024×768 resolution is a good combination of pixel density and screen size. Everything is very easy to read. The on-screen keyboard is wonderful. At least, it’s about as good as a non-tactile on-screen keyboard can be. I can use it almost as easily as a regular keyboard, though I have to be more careful and I definitely make more mistakes. Compared as-is to the hardware QWERTY keyboard on my phone, I prefer the iPad typing experience. However, I still prefer the hardware keyboard on my phone to the software one, as good as it is with predictive entry, simply because an on-screen keyboard on a 3.7″ display is still not fast or easy by comparison. The UI look and feel, speed, and eye candy are really nice. Everything seems to be very smooth and responsive. Android has some of the same visual features, but quite honestly it isn’t as polished in my opinion. I don’t think it’s lacking—certainly not in functionality, anyway—but iOS is just prettier than Android 2.2 (Froyo). Later versions of Android will address this, I’m sure. I don’t expect Android to try to mimic iOS, but I predict it will be just as polished and pretty in its own way, eventually. Don’t get me wrong; I really like Android for lots of reasons, including the UI since my only prior experience was Windows Mobile 5/6. The iPad wins this one though for the moment. The App Store seems more expensive on average than the Android Marketplace. After I did the initial setup and account sync, I started playing with the installed apps and browsing around the App Store. Having used the Android Marketplace for nearly a year, I have learned to control the urge to download anything and everything that looks remotely cool, since that inevitably means I’ll have to uninstall a bunch of apps later after discovering that “cool” does not in anyway automatically imply “useful.” So, I’ve looked at each eye-catching app very critically, especially the paid ones. Most apps are cheap, but if you find 25 “cheap” apps, you can easily spend $50 to $100 without realizing it. On my Android phone, I have bought perhaps three apps total, and spent less than $10. (Yes, my phone is rooted, and no, none of my apps are pirated.) The apps that I use 99% of the time are all free. Sometimes they are ad-supported, and sometimes they are simply free. The quality of those apps is excellent as well. I don’t feel like I’ve had to sacrifice any functionality to avoid paying, either. In the iPad’s App Store, many of the most popular apps are not free. Where the Android Marketplace has an ad-supported version and a paid version, the App Store instead has a limited demo version and a paid version. Obviously this is not true across the board, but it seems to be very common. It’s not wrong or evil, or even particularly worse, but it is a shift from what I’m used to. I really don’t mind paying for good tools or well-done games. I also (usually) don’t mind putting up with ads, but that option is much less available on the iPad. 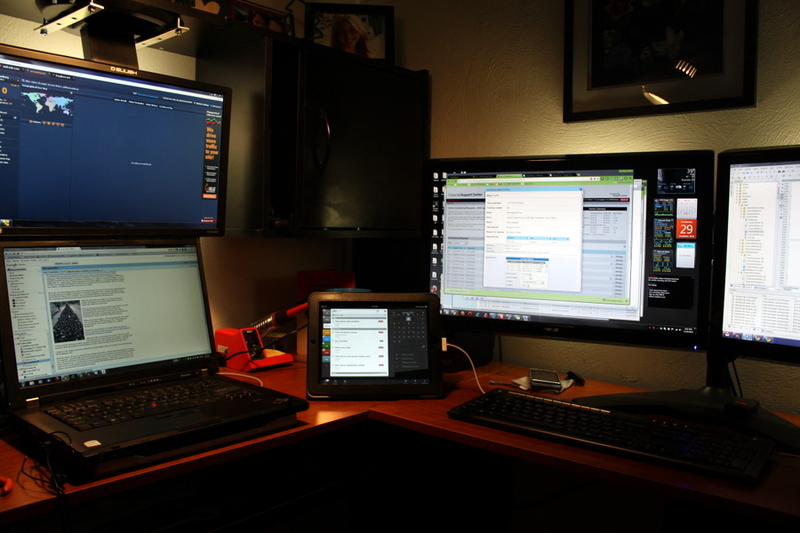 How does the iPad compare to the other computing devices that I’ve been using? Obviously, the opinions here are only mine, and others can legitimately make different points based on their own usage and goals. The points listed here are not meant to be comprehensive, but rather based only on the things I’ve noticed during my usage. The screen is smaller. This one is obvious, but it is an important point. Things that require a lot of screen space to do well (such as programming) may not be suitable for the iPad, even if there’s an app for it. The keyboard is not as nice. For speed and efficiency, the full-size keyboard wins. The iPad on-screen keyboard is remarkably good, but for extended text input, I definitely prefer the physical keyboard. For example, I’d still much rather write a blog post on my desktop or laptop than on the iPad. Browsing is not quite as good. For some reason, the iPad browsers that I have tried have all been noticeably slower to download and render than Chrome, which I use on my desktop and laptop. The network is the same, and I believe the rendering engines are at least very similar. For a device that seems to be remarkably fast in all other areas, this has been a surprise to me. It isn’t a problem, since it’s still pretty fast, but it is a bit of a puzzle. The screen is smaller. The same thing applies here as well as the desktop. My laptop display is 15.4″ and runs at 1680×1050 native resolution. The iPad’s 1024×768 is a step down. This isn’t a bad thing, because most well-designed apps present content in a way that doesn’t feel cramped. It’s more portable. If I had my own netbook (my wife has one, so this is a fair statement), I’d still say the same thing. The iPad is designed to be used with one hand most of the time. Although netbooks are very small, their form factor is different. The “clamshell” design inherent to laptops with hardware keyboards makes them more cumbersome to use while walking, for example. Of course, the trade-off between functionality and portability means that neither is inherently better than the other, but it’s important to think about what you need. The screen is bigger. This is the first obvious comparison. The Milestone’s display is incredibly sharp (3.7″ at 840×480), but that’s a little over half the pixel area of the iPad’s display at about 40% of the physical size. You can just do more with the iPad’s display. The on-screen keyboard is phenomenal. I’m reasonably happy with my phone’s on-screen keyboard. For the amount of text input I have to do, it’s almost good enough to convince me that I don’t need a physical keyboard. But the iPad’s keyboard is far, far better. Most of this is because it’s so much larger, and therefore less prone to fat-finger errors. Honestly, the predictive input and autocorrect on Android is quite good, even better than what I’ve seen on the iPad; but the fact that you don’t usually need any autocorrect on the iPad makes it a clear functional winner. It isn’t as portable. Of course, it is still very portable. Good luck getting it to fit in your pocket though. You have to carry it around like a small notebook, and for goodness sake make sure you get a case for it. You can’t hold it and use it with the same hand like you can with most phones. On the other hand, if you could, then by definition it would lose much of its unique functionality because of its necessarily smaller size. The question I posed earlier addressed how my habits might change in light of this new device. What will I use the iPad for because of an overall better experience than any other device? Reading news and blogs. The experience on the desktop or laptop is fine, but the iPad’s presentation and eye candy are much more pleasant. I use Google Reader in Chrome most of the time, and while I don’t have any complaints about that, it’s nice to have the magazine-like interface of Flipboard instead. This is definitely more about style than function, but it’s enough to make me shift from a browser on a laptop to the iPad. Taking notes. Using Evernote on this thing is great. It’s easier, faster, and prettier than using it on my phone, which is what I’d been doing previously (and because of the difficulty, I haven’t been taking notes very often). Being able to have the larger display area for notes is definitely superior to the smaller phone interface, and it’s also preferable to both the desktop and the laptop for portability and convenience. Free-form artistic design. I’ve never really considered myself to be an artist. But Adobe Ideas, a great free app, is an amazing tool for anyone who wants to try their hand (or fingers, to be precise) at art. It’s even better than many drawing tablets you can get for regular computers, since those don’t usually let you see what you’re drawing right on the tablet unless you pay a high premium for that feature. Adobe Ideas is a great casual tool for precisely that purpose. This “touch art” principle applies to any well-designed tablet computer as well; for tactile creativity, directly interacting with your hands is far more intuitive than using a mouse and keyboard. Time management. Many years ago, my parents both used Franklin Day Planners for managing their time. I can’t imagine using a physical product for that now, but the concept was excellent. I used an Outlook/Exchange system all through college, and that worked really well. But since I graduated and moved to Virginia, my days and tasks have become far less complicated. I work from home, and my schedule is very predictable. Outlook was overkill, especially since I started using Gmail for all of my email. I do still have tasks and appointments here and there, however. The iPad is a natural tool for time management of any level of complexity. You can use a very involved tool like Omnifocus, or something slightly simpler (and cheaper) like 2Do, or any of the very basic free task list apps. Personally, I’m using 2Do because it satisfies my needs, and because it syncs tasks with an online service. If my life were more complex, I’d pay the $40 for Omnifocus. The form factor and capability of the iPad makes it the perfect tool for time management. Casual gaming. Angry Birds on the iPad is quite literally a joy to play. It also does very well with board games, logic games, and the popular genre of “hidden object” games. It’s also great for developmental games for small children because the interface is completely intuitive. Once the screen protectors I ordered arrive, I’ll be happy to let my 2-year-old nephew try some simple puzzle games. Reading ebooks. I’ve mostly used my phone for this so far, and it does okay with it. The display on my phone is not bad for that purpose; it’s just smaller, so I have to flip pages a more often that I do on the iPad. I will probably continue to read on my phone some of the time because it’s portable and I always have it with me. However, as long as I keep my library synchronized across all my devices, I’ll prefer using the iPad whenever it is available because it’s more “book-like” and pleasant for that task. I really, really like this thing. I thoroughly enjoy using it, and I’d recommend it to others (though waiting for the iPad 2 might not be a bad idea, if you can hold off for a few months). Other tablets like the Samsung Galaxy Tab could also be excellent, and I’d certainly be willing to give one of those a try for comparison. In general, tablets can certainly hold their own among other devices, though not everyone needs one or would find as many useful applications for them as I have. The most exciting prospect to me with this device is that I now have an iOS device that I can write code for and test with. Sadly, I need a Mac in order to do that, and I don’t have one of those yet, but I’ll get one sooner or later—probably sooner, since the iPad is most definitely acting as a catalyst. I know that Mac development tools include iPad and iPhone emulators, but having a real device to test with is definitely preferable to me. I can hardly wait to get started and compare it to my limited Android development experiences. Thanks to everyone who pitched in to give me this awesome new tool/toy! And once again, happy new year! P.S. Good heavens, I just googled “goki blaster” and NOTHING CAME UP. I may have to enlighten the world with the beauty of that wondrous 80×25 console-based top-down alien blasting game in a future post. What you are writing corresponds to my own experiences , except maybe that I found quite a few useful apps that were free . But I don’t mind having to pay a small amount if it means not having to put up with ads. well what you telling ” I built a Linux server and played around with Red Had 5, Mandrake, and Gentoo”.are it means to redhat instead of redhad or something else. well which language you use daily in your life .net, ruby or something else. i like the post you write. Thanks, Anirudha! You’re right. That was an error, and I’ve fixed it. I mainly use PHP for most of my work, because I’m really familiar with it and it does what I need. I am interested in learning both Python and Ruby for different reasons, but so far I haven’t made time to do that. I also use Java for Android development, and I learned C and C++ back before I wrote web applications. But primarily, I do use PHP.